Sandy Wells interviews 102-year-old Grace Reinhart for an upcoming “Innerviews” profile. CHARLESTON, W.Va. — Sandy Wells is an institution standing in an institution. The institution she was standing in one recent morning is the West Virginia state Capitol building. She and Gazette-Mail photographer Brian Ferguson are hunting for the office of former state House of Delegates sergeant-at-arms Marshall Clay. Their goal? 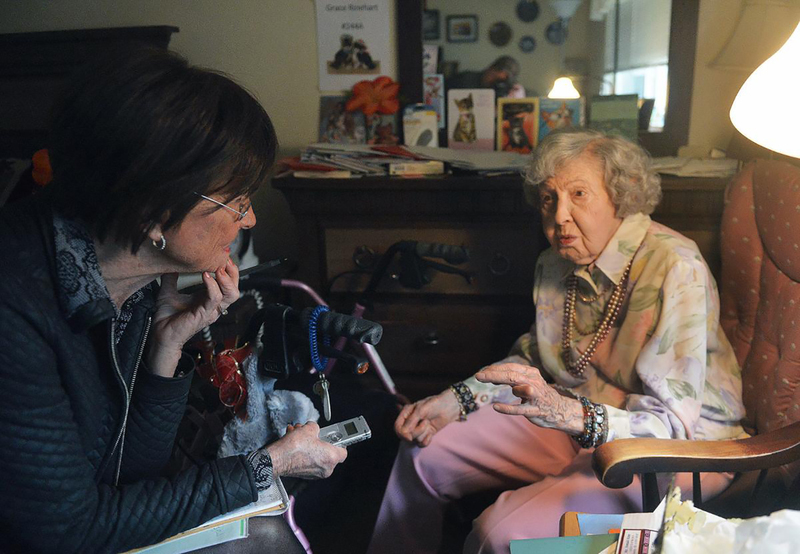 The next in a line of thousands of highly personal profiles for her long-running institution of a weekly column, “Innerviews.” Begun in 1988 in the Charleston Gazette, the column remains a weekly feature 30 years later in the Charleston Gazette-Mail.